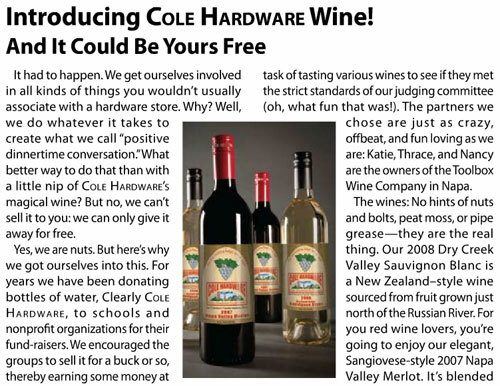 In coming home the other day, I pulled the Cole Hardware mailer out of my box. This is a local hardware store that, despite my pleas to the contrary keeps sending me a paper advertisement that I don’t read. This one time however, the front page caught my attention. Wine was to be offered by Toolbox wine in Napa Valley. While it will have the hardware store label, they won’t actually be selling it. It’s more a giveaway gimmick to spread their brand. 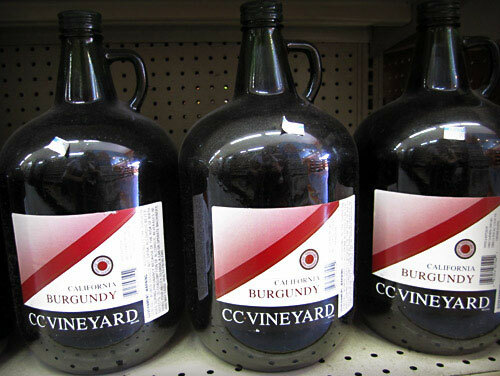 This in great contrast to a nearby liquor store that actually sells their “own wines” in addition to the “lovely” bulk burgundy you see below. I was of the opinion that Burgundy was a controlled name, but what do I know. As for the taste of these wines, we would rather offer up that you try a burrito from El Tesoro which is a Mexican joint housed within the Mid City Market and serves up some of the best food in downtown San Francisco. For a wine to have with said burrito, we’d recommend going a few blocks up to Biondivino instead.